• M&T Bank, accepting toys at the branch at First Avenue and 23rd Street. Deadline to donate has been extended one day to Friday, December 15. Toys should be unwrapped. Readers of Town & Village have once again made the holidays a little brighter for children stuck in hospital rooms as well as the families utilizing the outpatient clinics run by Mount Sinai Beth Israel by donating over 250 toys to this newspaper’s annual drive. Gifts for kids of all ages were donated this year, from board games to books to stuffed animals to arts and crafts supplies to games sure to cheer any fan of Star Wars. Town & Village’s partners on this longstanding community tradition are Blackstone/Stuy Town Property Services, the management of Waterside Plaza and M&T Bank on First Avenue and 23rd Street, who all provided convenient toy dropoff sites. Bonnie Robbins, PhD, coordinator of children and family services at Mount Sinai Beth Israel, has said in recent years the hospital has faced some difficulty in getting enough toys to meet the needs of patients. This is due to the economy as well as other factors like drives for larger organizations competing for the support of individuals as well as toy retailers. The hospital’s clinics are located throughout the city with three in the Kips Bay/Gramercy area, and for many patient families, parents often have to choose between clothes for their children or toys. Fortunately, the turnout of this year’s drive, Robbins said, will be a big help. The staff of Town & Village would also like to say thank you and happy holidays to our readers, SPS, Waterside and M&T Bank. Bare floors create worse noise in converted apts. I would like to add that when apartments are sub-divided and the dining area and another three feet becomes the new living room area and when there are several people in that area (as is often the case), the noise volume is exponentially increased because of the small enclosed space and the echo created when there is no carpeting. It is sad and unfair that we (I am a lifelong tenant) are unable to enjoy peaceful days or nights in our apartments anymore. I am surrounded both next door and above, with new tenants who either stomp all of the time, drag furniture across the bedroom floor (between midnight and 3 a.m.) and/or who frequently have noisy company, in the “mini living area” during the day and late at night. And I won’t even mention the constant loud slamming of the apartment doors! In fairness, I have called security several times and they did speak to the offending tenants and remind them that they are supposed to have carpeting as well as that the noise level was unacceptable. One time, when the stomping and noise level did not abate, security retuned again and spoke with them. They also assured me that they would file the requisite reports. Although I am a lifelong tenant, I have had several apartment inspections, which I was told were normal protocol – to verify that we did not put up an illegal wall, which we had not. How are these other apartments not having the same inspection, including for carpeting? Perhaps the solution is for management to inspect new tenant apartments for compliance and install commercial carpet remnants (cheap enough) when a violation of the carpeting rule is discovered. Since many tenants are transient, they are not motivated to comply with the rules, if there is no penalty imposed. With the holiday season around the corner, Town & Village is asking readers and community residents to help spread cheer by participating in our annual holiday toy drive. This year, the drive will deliver gifts to Mt. Sinai Beth Israel Medical Center. Toys will then be distributed to children of patients of the hospital’s outpatient clinic programas as well as to children who’ll be spending their holidays in hospital rooms while undergoing medical treatment. Gifts appropriate for children of all ages are welcome with items for older kids (13 and 14-year-olds) being the highest need. Due to hospital policy, the donated items must be new. Partnering with T&V on the drive this year by providing convenient dropoff points are CWCapital/CompassRock, the management of Waterside Plaza and M&T Bank. • The Town & Village office at 20 West 22nd Street, 14th floor. Bonnie Robbins, PhD, co-ordinator at Mt. Sinai Beth Israel, said gifts from drives have made a world of a difference to the children the hospital serves. In many cases, their families would not be able to provide them with any presents . At Town & Village, holding a toy drive around the holidays to raise money for kids undergoing treatment at a local hospital is a tradition that’s spanned decades. 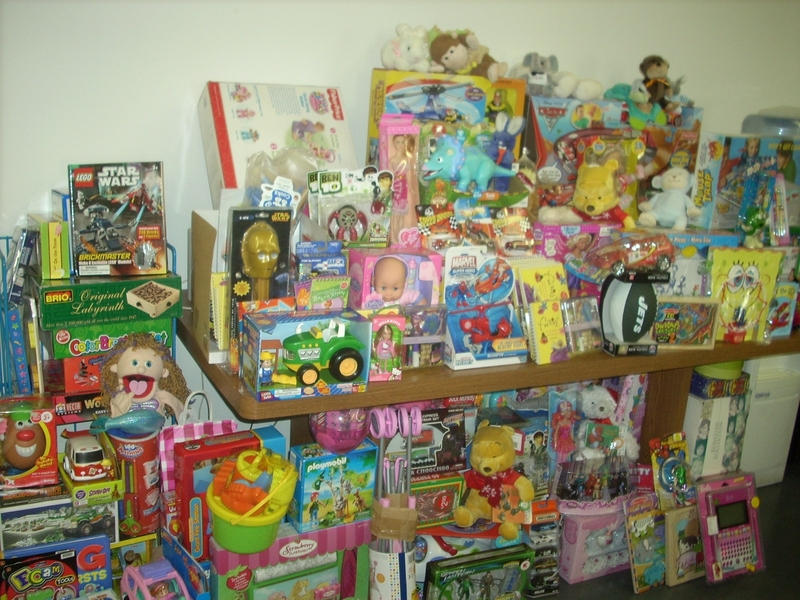 This year, thanks to the generosity of our readers, nearly 100 toys were collected to benefit Beth Israel Medical Center. The toys will be distributed to kids spending their Christmas at the pediatric department as well as to families who whose members are patients of the hospital’s outpatient clinics, who in many cases, could not afford gifts for their children. Among the haul were gifts suitable for kids of all ages from babies to tweens, including dolls, action figures, games, books and a few gadgets. Bonnie Robbins, coordinator of children and family services at Beth Israel, said the toys were especially needed this year. Following Sandy, she noted, more families have been utilizing the hospital’s clinics. This has been in an addition to an uptick in families since the recession began. Robbins as well as the staff at Town & Village would like to extend our heartfelt thanks to those who donated as well as those who offered space as toy dropoff points. This year’s dropoff points were the Waterside Plaza management office, the Waterside Swim & Health Club, M&T Bank on First Avenue, Paddy Maguire’s Ale House and the Stuyvesant Town Community Center.